There were officially zero tech IPOs in the first quarter of this year. That makes it the slowest period since the depths of the financial crisis in 2009. The only sector that saw some IPO activity was health care, which had eight companies go public, according to Renaissance Capital. "Companies and their bankers know that in this market, you'd have to take a pretty steep valuation cut to your public peers," said Matt Kennedy, analyst at Renaissance Capital, who added that in some cases, the cut could be as high as 50%. Square served as a cautionary tale, but the stock market's volatility at the beginning of 2016 didn't help matters. In fact, eight companies postponed their IPOs this quarter, including cloud storage company Nutanix, which filed its prospectus in December, and Elevate Credit, which was looking to raise $75 million. 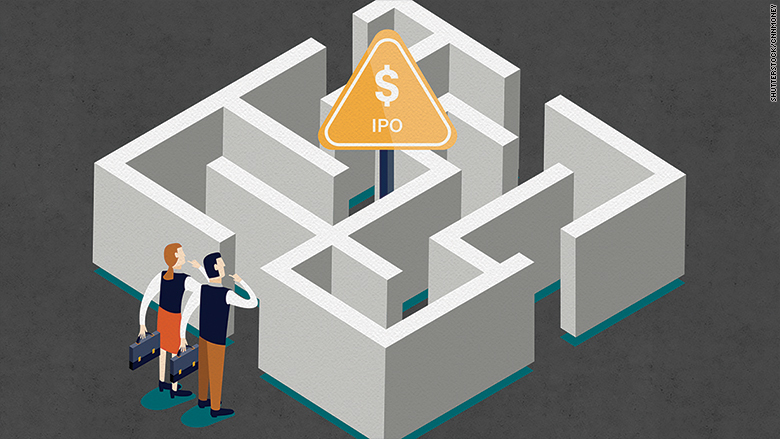 "Volatility in the markets is absolutely the enemy of IPOs," said Lise Buyer, IPO consultant at Class V Group. But things could be looking up. On Wednesday, the Dow reached its the highest level all year. Buyer said she's starting to see entrepreneurs and investors shift their attitude about going public. "There's a recognition that even though it's difficult to be a public company, it's in many ways healthy. It imposes a healthy discipline on growing companies," she said. Private capital isn't going to dry up anytime soon, but investors are getting smarter about how they're allocating their funds. In the first quarter of this year alone, venture capitalists have raised around $13 billion to invest in startups, according to preliminary data from Dow Jones VentureSource. That's the largest sum since 2000. But Buyer said investors won't be investing "willy-nilly" in overpriced late stage rounds like they have in the past few years. "[Private investors] didn't think public investors would be as savvy about what they were willing to pay," she said. "They assumed that public investors would just pay more. Nope -- they're not interested." Buyer said one thing is certain: There will be "down rounds." That's when private companies raise money at a lower valuation, and it'll be necessary before an IPO. She said she's seen a "healthy number" of companies preparing to IPO -- even if they haven't said so publicly. "We need someone with rock solid numbers," she said, citing Atlassian (TEAM), a cloud software company that went public in December. The company had been profitable for 10 years before going public, and its shares surged 30% on its Wall Street debut. "Everybody wants someone else to go first." Some, like SecureWorks, have started the process. The security firm, owned by Dell's parent company, Denali Holdings, filed for an IPO in December and has continued moving forward, said Kennedy. Other companies expected to IPO include firms like Japanese instant messaging app Line, Jessica Alba's The Honest Company, Okta, Twilio and Coupa, according to Renaissance Capital.